If you double-click on a data file in Windows Explorer (eg a picture file or document), then Windows will open the program that it thinks “controls” that type of file, and then open the data file (document) in the newly opened program. Sometimes, you may prefer a different program to open a particular type of file. For instance, the Windows Picture and Fax Viewer may open “jpg” files whereas you would like these to be opened with Photoshop. 7) Click the “Change” button. This will produce a list of the programs that Windows suggests may be suitable to open this type of file. 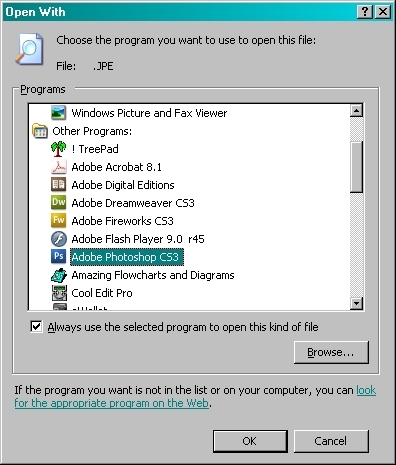 8) If you see the program you want, double-click on it and then close any open boxes. 9) If you don’t see the program you want, you can browse for it by clicking on the “Browse” button. You will then need to identify the program you want, double-click on it and then close any open boxes. In this example there are 3 different file names associated with jpg files (see (5) above), so repeat the exercise for all three types if you want Photoshop to open any type of jpg file.